At Shallowbrook Equestrian Center, we strive to provide a safe and healthy environment that nurtures the psychological and physical relationships between horses and clients. Shallowbrook Equestrian Center is a full service boarding facility, and we are proud to provide the finest in horse care according to the specific needs of each horse. Board includes daily turnout in private grass paddocks. Our trainers provide dressage, jumping, western and general horsemanship lessons as well as horse training and instruction. We feel that building our students confidence and understanding helps them achieve much success in the equestrian world, all in a positive and fun atmosphere! Communication is a huge part of our training philosophy and allows each person, no matter what their skill level is, to understand how the horse thinks and how to better communicate with their equine partner through simple horsemanship tools and techniques. Most importantly, we provide fun! Whether is be hacking with your friends in the field, supporting each other at horse shows, or learning a new riding skill, we always want you leaving with a smile on your face! Shallowbrook is the home of several rated and schooling horse shows. Shallowbrook is conveniently located 10 minutes from highway 91, 25 minutes from Bradley International Airport, and 45 minutes from Tufts Veterinary Hospital. The highest compliment our clients can pay us is the referral of a friend. Please let us know if you were referred by a current client. Looking to join an IEA Team? 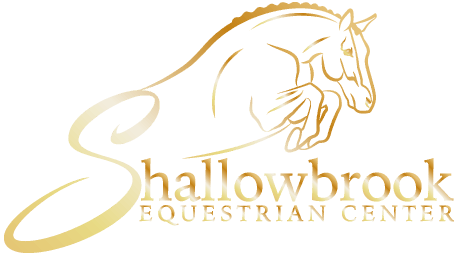 Shallowbrook is accepting new riders! Come board at Shallowbrook Equestrian Center! Learn all about our amenities. Shallowbrook hosts many rated and schooling horse shows throughout the season. At Shallowbrook Equestrian Center we offer all levels and disciplines of riding lessons, beginner to advanced. Shallowbrook Equestrian Center offers summer horsemanship camp for all levels of riders. Don't leave your yard and pets unprotected. Click here to learn more info on our programs! The Tack Shack is tack shop located on the grounds of Shallowbrook.